November was the month that smiled on me, allowing me my first slice of the African Film Society’s Classics in the Park series. Under the still Osu night with a cool breeze forcing its way from the sea, the curiously christened ‘Akola Boni’ Park serves as the monthly meeting point of some cinephiles and culture junkies with vintage African Cinema, and not ill intent, on the agenda. The three-month-old Classics in the Park series has seen films like Kukurantumi; Road to Accra and I Told You So screened alongside some cinematic shorts from the continent. 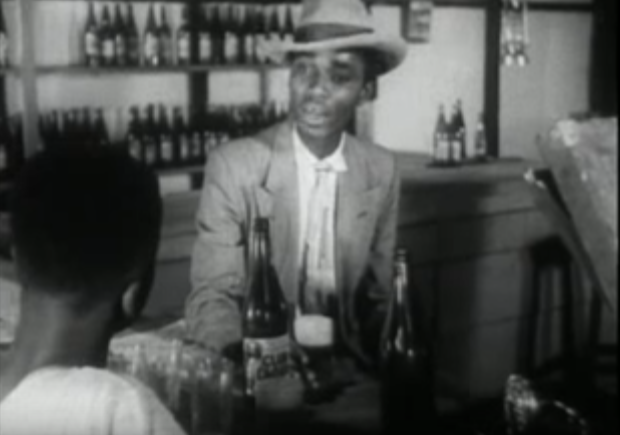 The November screening was to be headlined by 1952 film, The Boy Kumasenu. But before this, the audience was treated to two shorts; Progress in Kojokrom and The Encounter. The Encounter, directed by a Tolu Ajayi, is a Nigerian short that narrows in the relationship of two men and their differing viewpoints on the backdrop of the Nigerian Civil War. Context is key to appreciating this film as it does very little explaining and is all about character. There is some intrigue seeping out of The Encounter and it may come up again on this blog someday. But allow my GH biases to be, especially with elections around the corner. 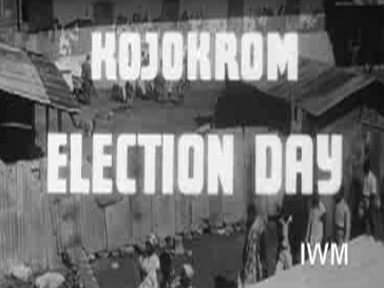 The first short screened on the night, Progress in Kojokrom, had elections and governance on its mind. Progress in Kojokrom presents the eponymous town which is the staging ground for a larger message that resonates and stirs some healthy debate today. It certainly stirred some debate in 1953 Ghanaian society, coming off its first General Election in 1951 which the Convention People’s Party (CPP) won, and looking ahead to proper independence from British occupation which the CPP championed – yes kids, the CPP used to be extremely relevant. Though set in Ghana, this is ultimately a British production, directed Sean Graham of the Gold Coast Film Unit. There is some interesting correspondence of him outlining the challenges he had with this production, including criticisms of the scriptwriter for failing to relate to the local population. “He [the writer] has little interest in this place, and has failed to make any friends among the Africans”, Graham is noted to have said. You wonder what British thought of us at the time given we were on the road to independence and assuming control of local governance. The British narrator clouding this film didn’t help as it made assigning perspective a tad difficult. One of the first few lines of the narrator makes reference to local government elections having very little meaning. We come to learn later that the film’s protagonist, Mr Addo wants nothing to do with the council but the opening narration certainly felt like thoughts of the British slowly losing a stake in local affairs of the Gold Coast. Unsurprisingly, there is money at the heart of Mr Addo’s dislike of the council. He does not want to pay his rates, basically a community development levy of sorts. In some fine humour beats, we are treated to a montage of him realising the local government has basically enveloped his life. He lauds the work of the officers keeping the street clean till he realises they are employed by the local council. A kid sprains an ankle and being the good Samaritan he is, he rushes the kid to the community clinic but decides the kid’s pain is less important than his dislike for the council, thus he turns away from the clinic upon seeing it is run by the council. Then there’s the scene of him whisking his daughter away from school when confronted with the sign post that tells him it is also run by the council. Progress in Kojokrom is ostensibly a propaganda piece. It literally ends with a speech by the Minister of Local Government of the time yobbing folk and urging them to buy into local governance. Rest assured, Mr Addo’s thoughts on the payment of rates will bend. His scowls change to smiles and gripes turn to praise when the council invests in a water system that will keep women like his wife from trekking long distances via perilous bamboo bridges to a river for water. Rates are well spent when they directly impact you I guess. Finding nuance in such a film will be difficult but perhaps it scrapes off a layer that questions if the rates will increase now that there is now an elaborate water system to maintain. The plot unravels in the manner of a 90s sitcom, like a number of you average films from the early days of cinema, before directing styles and narrative execution began to really evolve. The score reminded me of some old timey Disney films when some highlife would have sufficed. You could however argue our modern scores are generally western influenced so let’s just give a meh to that. What remains clear is that the narrative structure of this 1953 film, and indeed the main feature on the night, The Boy Kumasenu, retained some degree of fundamental coherence. To paraphrase a guy around me during the screening: what happened to this blueprint? If you watch enough contemporary Ghanaian films, you know our scripts writers have such difficult time crafting a fitting resolution for a narrative. My favourite piece of GH cinema is probably 6 Hours to Christmas, a pleasantly surprising black comedy directed by Shirley Frimpong Manso, but by God does it have an irritating dénouement – like a scrumptious chocolate muffin, but one with raisins you have to gallingly pick at and navigate through. FYI, I detest raisins. It appears there was more of an architect’s approach to the filmmaking back then with everything expected to fit into the schematic per the workings of what I’ve seen of vintage Ghanaian film so far. The Boy Kumasenu, also directed by Sean Graham, was nominated for a BAFTA for best film in 1953 which, factoring in the fact it was one of 17 nominated films, meant it was pretty damn good for its time or a real peach of a novelty. It obviously has a more ambitious reach than Progress in Kojokrom. It tells the story of the young Kumasenu longing to make a move from his fishing village of Keta to the urban paradise of Accra. He has a strong desire to move to the greener pasture of Accra and this is accentuated by his cousin, Agbo, who returns to the village, after his voyage to the city, flashing the slick suits and crisp Shillings. Kumasenu eventually takes a questionable route to the city, a route that will come back to bite him. At present, it’s the hunger and loneliness, despite the numerous faces, that gnaw at him physically and emotionally. A far cry from the countryside. This film also plays as a coming of age story for Kumasenu, maybe Ghana too. A desire to become more like the West perhaps? His longing to the make his way to the city is presented as a natural inclination to spread one’s wings and shed the rural life like a butterfly bursting out of a cocoon. Alas, it is an infinitely more complex world Kumasenu is transitioning into, even more so given his past sins. Like Progress in Kojokrom, The Boy Kumasenu has a British narrator acting as a subtitle surrogate here. He basically conveys most of the dialogue which pleasantly cuts across multiple ethnic lines; Ewe, Ga and Twi. The intrusive narration gives an indication of the film’s target audience, i.e. not Ghanaians. 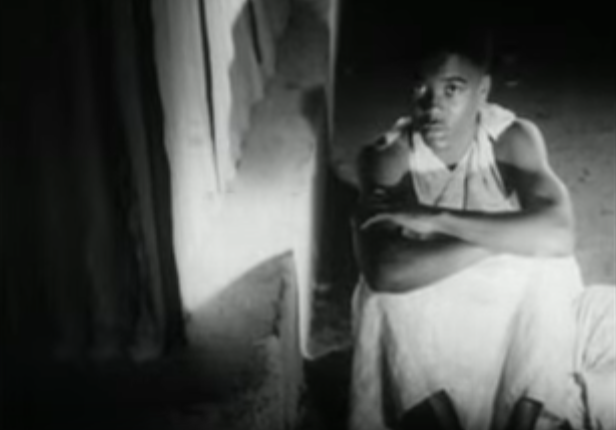 The visuals do a lot of the work from a narrative standpoint as this era of filmmaking was still holding hands with the period of silent cinema. Of note here is the ever poignant trope of aggression seen as the resolution to Kumasenu’s internal and external conflicts. The boy becomes a man when he realises turning from the hunted to the hunter would be in his best interests, and indeed, the people he cares about. The optics and aesthetics of 1950s urban Ghana also offer up some intrigue with the representation of nightlife which has a surprising amount of man-on-man dancefloor action and lots of Club Lager – since 1931 people. Populations were less dense, but Accra is still shot as an unwelcoming concrete jungle that enveloped Kumasenu without acknowledging his existence. I doubt I intended this post to be compact quasi-film reviews but the time travel experience presented by the Classics in the Park series is all about cinema. The various films screenings are interspersed with fine records, this past week from the funky professor, Kobby Graham. He dropped some Fela, all he needed to do to garner two thumbs up from me. 1950s Ghana (and Ghana stretching all the way to the late 90s) is still an unexplored frontier for me so the flashbacks to vintage Ghanaian cinema could reach insightful cinematic highs, but at the very least will be enjoyable history lessons.